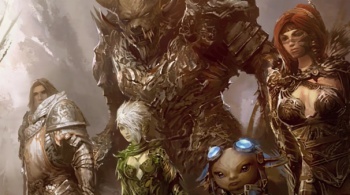 Guild Wars 2 has achieved sales success despite the hold on digital copies. It became fairly obvious that subscription-free MMO, Guild Wars 2 was selling pretty well when NCSoft had to halt digital sales of the title while it beefed up its servers to handle the flood of new players. Total sales of the game hit 2 million shortly after digital sales were resumed on Monday. That being said, the actual player load doesn't seem to have increased too dramatically. The game is regularly hitting 400,000 concurrent players, the same number that was hit before it actually launched. "Reactions from around the world justified the time and care we put into developing Guild Wars 2 and making it into the game it is today," announced ArenaNet president Mike. "And this is only the beginning. We're continually fine-tuning the game to deliver the polished experience that our players expect, and we're already working on new adventures and experiences to introduce into this truly dynamic online world." For comparison: since its release, The Old Republic has sold around 2.4 million copies, and the western release of Aion clocked up nearly a million sales in its first few months on the market. Guild Wars 2 has enjoyed a warm critical reception, and even the notoriously picky game connoisseurs who pen Metacritic user reviews have given it a generous average of 8.4.